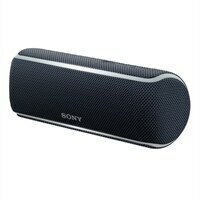 Small on size, Big on fun The compact SRS-XB21 fits easily in your bag. You can even pop it in the bottle-holder of your bike - so the party goes wherever you go. There's no fun without party lights, and the SRS-XB21 has just the thing—flashing new line lights that sync to the beat of your favorite tracks. Thanks to the IP67 rating, you can take your speaker to the beach, the forest, the desert, or wherever you like—the SRS-XB21 will keep on playing, no matter how dusty the surface. Up to 12 hour battery means the SRS-XB21 can party even longer than you can.